The other day I was standing in line at the Ace Hardware store waiting to pay for a can of spray paint when I noticed that the franchises’ owner had decided to carry a line of old fashioned bottled sodas and other beverages I’d never heard of before. An impulse buying line of flavored drinks. Amongst the bottles was a clear bottle, filled with an orange tasty soda. I reached up on the top shelf and bought it. I knew if I took a swig of it, flavorful memories of my Dad would roll off of my tongue. The family car, a ’58 Chrysler, pulled off the ramp leaving the darkness of the highway behind and then into the circle drive of a motel just off of I-35 outside of Wichita. Mom was driving, Dad and my sister were sleeping. My sister was annoying when she slept as she would mush up her pillow against the door and bury her head into it. Every few minutes she would jerk as if she was being electrocuted and make the seat move so there was no way I could sleep. I wanted to pound her but when Mom could read my mind telepathically, she would give me the threatening look of a Chinese bamboo shoot torturer. Sometimes I would lay on the floor of the backseat to try to doze off but the vibration in the hump of the floor would tickle my nose and I would wake up. I sat quietly in the dark listening to the engine and road noise while my sister acted in her sleep like she was seated in San Quentin’s electric chair. Finally instead of pitch blackness in the back seat for the last few hours, the interior was suddenly lit and I could see the small clock’s hands inset on the dash, indicating it was around 10 o’clock. I was seated directly behind Mom. This was very unusual as I thought if I always sat behind Dad, there was no way he could reach around and smack me for something I did. All this time I just thought my Dad never touched me in punishment and now I realize it was because of my smartly designed seating assignments. She pulled through the gravel drive slowly and came out of the exit. The small stones cracked under the weight of the car as the tires turned around again. 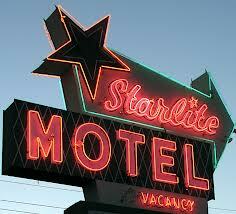 The large sign on the road read, ‘Starlight Motor Lodge’ and shined bright enough you could see it a half a mile down the road. The red vacancy light flashed on and off welcoming anyone who needed to rest for the night to come on in. Mom’s hair glowed red then dark then red then dark again with each lighting of the neon light. I rolled the window down and looked through the glass of the office door. No one was inside manning the desk and the door leading to the manager’s room was closed. Dad glared over his shoulder at me, his SpyEye in the side of his head must have had a crust of sleep still in it. He pushed open the heavy door and got out. He pressed a black push button next to the office door’s handle and waited for the person inside to come out and release the door lock. While Dad was inside, a train appeared on the tracks suddenly and directly behind the motel and sped by us at a high rate of speed without any whistles or horns. Just clacking loudly as each wheel struck another joint in the rails. “Any rooms available?” Dad asked. “We always have rooms,” the man answered. Dad returned with a key with a plastic tag hanging from it and walks up to the window as Mom rolls it down. “Number four,” he shows her the tag. “Right there, ” he nods his head to his left. Mom put the beast on wheels into drive then slowly pulls next to the walkway nearest the room as Dad walks next to the car. Room four’s back wall faced the tracks. We unloaded what we needed to sleep the night and lights were out within minutes. It couldn’t have been long before the clacking of the train began again and passed quickly and disappeared into the darkness. Dad sat up and asked in the broken stillness of the tiny room, “What the hell was that?” He knew but his question was purely rhetorical. Well the train’s schedule became apparent as from then on and exactly each hour a small freight train would zoom by the bathroom window of the motel room. 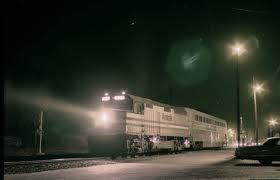 We only had six more runs of the railroad to endure that night until sunrise. Once up and in the car, we’d get breakfast first, then make the final push into Omaha for the meet at AK-SAR-BEN race track. Dad told me in the morning that the first priority for him is to set me down on the table and cut my hair. He hated anything longer than an inch so my trips to the kitchen table were more often than not. Dad was a terrible barber in my eyes. He made Howard McNear, the famous barber Floyd Lawson of Mayberry, look like Vidal Sassoon in his prime. He thought he was a hair scientist and experimented on my head every time he gave me a haircut. A part, not a part, a buzz or a flat top. Last time he actually let my bangs grow out only to see if he could cut them on a 45 degree angle from my right eye up to my left forehead. I have no idea what I was supposed to look like or if I was to comb it into a part on my left side of my head. I just let it hang stupidly and told other kids it was a new fad. He must have thought his left thumb and forefinger of his left hand were precision scissor machines and the small black comb he kept in his back pocket was his right hand’s scepter. Around six, the train made its way past us. I opened my eyes just like I did every hour since midnight to see Mom doing her hair in the bathroom. Dad was snoring. “C’mon everyone, we have to get going,” she announced. The rest of us staggered out of bed and within a half an hour we were pulling out of the drive. “The guy said he always had rooms available. Now I know why.” Mom laughed about the train going by all night. We pulled out onto the pavement and made it to a breakfast place to eat. While eating, Mom told Dad that there was no more clothes that were clean and we would have to wash them as soon as we get to the trailer park. Dad paid the bill and we were off. The drive from where we were to Omaha took at least 5 hours. Dad stopped once at a grocery store so Mom could pick up enough food to get us by for tonight and tomorrow. Dad said we could just eat at the cafe but Mom said she was sick and tired of eating in restaurants. The long tan car lumbered off of Dodge street and pulled into the park’s entrance. We unloaded the trunk into the back door by the bedrooms. Mom said she was going to take the clothes and go up to the laundry room to get a load started and then come back and make us something to eat. Dad unpacked the boxes in the back bedroom and us kids threw what we had in the second bedroom. I went outside to check out the neighborhood. Mom must have come back quickly after she found out about the laundry rooms demise. an ‘Out of Order’ sign was pasted on the doorway. I had gone up to see if the Wards were here yet to see George and Mike. They weren’t. On the way back, the Chrysler, with Mom and Dad in it, pulled up to me. “Jump in,” Dad said. I got in the monstrous car carrying with me a stick I had picked up on the way, “Where we going?” I scooted over to directly behind Dad so I could act like I was spearing his head with the stick like Tarzan did on the weekend TV show. I’d try to flick off the small specks of dandruff in his hair but he’d feel it and swipe at it like a bug was pestering him. We crossed over the Papio bridge and past the old house our friends live in on the side of the Papio creek’s slope before the flood. The house was empty. Dad made a couple of turns here and their and pulled onto a street that was cobblestone. 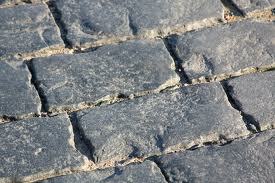 I don’t remember ever being there before and the cobblestone was amazing to me. Slowly he pulled in front of a white plaster small building with glass windows from the floor to the ceiling on one side of the door which was also glass. Mom and Dad got out and pulled the wash bags out of the trunk and took them inside. I opened my door into the street a little to look down at the cobblestones. I reached out and down and dragged the tip of my stick through the grooves. Dad came back without Mom and got in the car. He pulled out a Racing Form, leaned back in the seat and began going over the pages for tomorrow’s race card. I quickly was bored with the cobblestones and I too slouched into the huge padded backseat. I pushed with my feet and opened the door so it would stay open by itself and propped my feet up on the arm rest. A car came up behind us and passed by. I didn’t think it was that close to the door to have to honk a little but apparently the driver did. I didn’t move and focused my attention more on peeling off the bark of the stick. The honk caught Dad’s attention and he turned his head slightly without making eye contact with me. “Close the door Billy,” he asked nicely. I had started a very long piece of bark and didn’t want to ruin it so I just ignored him. Another car passed by. The car didn’t honk so it was proven that the first car’s driver needed a little more horn-blowing etiquette. Dad could tell by the louder sound that the door was still open. “Please close the door.” His tone changed slightly but didn’t enough to warrant my, ‘Dad is pissed’, alarm to go off so I sat. I now had a formed a knot in the long piece of bark and was using the knot to make a really nice bark ring. Dad changed pages of the form and was reading the left side of the printed folio. His SpyEye he had on the side of his head underneath his hair must have noticed the door still open when he tilted his head to read the left page. A car passed by. “I told you to close the door!” He contorted his body and reached over the seat with his left arm intending of doing me harm by slamming the door shut with my legs still propped on the rest’s padding. The, ‘Dad is pissed’, alarm sounded and I quickly lowered my legs drawing them inside and reached over and grabbed the door’s handle and pulled it closed with a clunk. Dad sat up quickly, his body was turned in between the steering wheel and the back of the seat. Dad’s arm was still over the back of the seat and fully in my personal airspace. His face looked as what a mobster would look like while being whacked in his car and the shooter is firing from outside the driver’s window. Dad had a policy, mom didn’t. The policy stated clearly there would be no extreme swearing words in this house, especially the infamous ‘F’ word. I never knew that in the policy that it stated also that one could break the policy when appropriate and only Dad could make that determination. I looked down his arm to his hand. It appeared by the lack of five fingers showing that one, being his thumb, was missing from the mix. His hand was stuck right at the point where inside the guillotine-like hinge might be lurking. I knew for sure he couldn’t smack me so I took my time releasing him from the Chrysler’s snare. I know I had to think about that for a moment because it wasn’t seconds earlier Dad had commanded me to close it. I reached over and pulled the shiny handle. I pushed the door open and Dad withdrew his hand as blood squirted out from his thumb in a very thin stream. “F*** me!” Dad yelled downward at his hand. The Racing Form was in shambles and I knew he never liked the Form in shambles. I thought I better leave him now as he was now loose from the door’s firm grasp. I pushed opened the door fully as Dad had broke policy once more. He apparently had the right to do so. Another car passed by and honked but Dad didn’t say anything about it. I looked down toward the cobblestone and there in one of the grooves was part of Dad’s thumb. I started to poke it with my stick but decided not to as Dad’s neck had begun to sweat and was staining his bleach white collar. I put my barkless stick down on the seat in a safe place. Dad, in a rush of judgement, had apparently missed his target of grabbing the handle and foolishly slipped his hand into the hinge. As the hinge closed, it snipped off the tip of the thumb with a little part of the nail also like scissors to a ribbon on Christmas. If I had done that, he would have told me that ‘I wasn’t paying attention to what I was doing’. But this time it wasn’t my hand in the door this time so he must have been the one not paying attention this time. Sweet redemption was mine and I thought of giving him a sarcastic thumbs up. The pink thumb part on the street wasn’t moving. It’s tiny chest was not rising and falling so I knew it was dead. I picked up my stick again for a moment and set it back down on the street. I leapt from the car taking great care not to step on the deceased and went around the back of the car. As I was almost to the door when Dad leaned over and cranked Mom’s window down. “And get me an Orange Crush!” he barked. I guess he knew she had quarters for the machine since she was doing the wash and knew that getting a soda took quarters. I nodded and hurriedly opened the glass swinging door and went inside. She was folding sheets or something and looked down at me and simply said, “Okay.” She continued to fold. “Okay, I heard you the first time. Get me a quarter. They’re over there,” she nodded her head to the table behind her. Mom placed the folded sheet on the basket and grabbed the quarter from between my fingers. What she didn’t know is that I had another secret quarter tightly clenched in my other hand. The pop machine was the honor type of machine where you left a quarter in a bucket and grabbed the soda from a cooled rack. She reached in a grabbed the glass bottle of orange-colored beverage and dropped the quarter in the steel bucket. I was eyeing the bucket as soon as she turned but that wouldn’t be honorable. She popped off the top then casually walked outside. I stayed inside and watched as she leaned and handed the bottle through the open window. Instantly she withdrew the bottle and turned running back to the door, bottle in hand. Her dress was flowing behind her in a nurse nightingale way as she swung open the door and ran up to the basket of clothes. 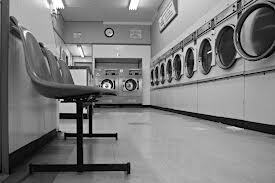 As she opened the lid on the washers she looked at me and said, “Get in the car now!” I tucked the silver twenty-five-cent coin in my pocket and started to the door and she stopped me, “Here take this.” She handed me the bottle of Orange Crush. I walked outside and opened the back door. I looked down and saw that a black hard-shelled beetle was trying to roll the fleshy food Dad left for it on the road into a managable ball. I pointed to the thumb part and started to say something about the insect. I decided not to say anything and walked back around and got in the car on Dad’s side. He had moved over to Mom’s side and didn’t turn around. He was clenching his thumbless hand with his other hand. I felt the bottle and the soda was still cold so I took a swig of the sugary drink quietly. Mom came rushing out with wet clothes in one basket and placed it in the open trunk. She rushed back in and picked up the second basket and rushed out to put it in the car too. She was limping. I think she broke a heel. Mom made the last and final trip and closed the lid of the trunk. Dad looked at me with the spy eye. I could tell so I leaned sideways and took another swig. Mom rushed into the driver’s seat and in one motion started the hemi. She pulled away quickly, the tires shuttered on the cobblestone. About a block away Mom turned her head to Dad who now was groaning. Not a real moan but more of an internal sound, like what comes out of your belly to warn everyone just before you cut the cheese. “I left the quarters,” she announced. “F*** a bunch of quarters!” Dad broke policy again for the third time today. “Where’s the rest of it?” she asked looking down at his lap and back up to the road ahead. I knew the thumb’s delectable tissue was soon becoming lunch for a lone black arthropod who lives in the desolation of the cobblestone grooves of the road but kept quiet. “Well you don’t have to swear at me. And anyways, how the heck did you do that?” Mom was now making the point she could talk without violating Dad’s rule of the house. Dad said nothing as he turned his head slightly and looked at me out of the corner of his eye. I pushed the bottle of Crush out of his view. Mom rounded a corner at high-speed and Dad’s concentration moved to the road. I took another swig. We ended up at a small farm hospital and I sat in the car waiting for a long time before Mom and Dad came back. Dad’s hand was bandaged like he had cut off all of his fingers. Mom drove again and as she turned the empty bottle made a clink as it rolled under the seat halfway and touched the metal runners of the seat adjustment. I put my foot on it and turned away, faking as I was looking out the window, as Dad’s head was turning my way. Slowly we made it back to the trailer and Mom helped Dad onto the couch as if he’d broken his back. I stayed outside and I could hear Dad request vodka. I quietly opened the back door and retrieved the glass bottle and tossed it under the neighbor’s trailer. Dinner came and went and I went to bed. The next day, Mom made me breakfast. Dad had gone to work. After eating, she told me to go out and play until lunch so that’s what I did. I jumped off the steps onto the grass and started to the Ward’s house to see if they were there. As I walked I noticed a big smear of gravy on my shirt that had been put there by a loose drumstick of chicken bouncing off my belly days earlier. I felt the hardened food and scraped at it with my fingernail. How come Mom didn’t wash my shirt? I wondered. Passing by the last row of trailers I came up to the row of small houses where the Ward’s should be. No one was home. As I walked back I pushed my bothersome hair off of my forehead. I remembered Dad said it was his first priority to perform another experiment and cut my hair when we got here. Then I smiled. A flash of an image came through the front lobe of my small sugar-filled brain. The picture was clear and was of Dad’s, now a half inch smaller, left thumb wrapped in too many layers of a thin translucent cotton gauze to fit in the scizzors. I turned around and looked up the driveway at the cafe. I felt my pocket of my jeans to make sure the quarter I presumably found in the laundromat was still there. Pushing my slanted bangs back out of my right eye again, I thought to myself, ‘Yep, that’s exactly what I’ll do’. One of the WiseGuy best stories to date. It gets a thumbs up from me! Next Next post: Horse Racing is a ‘Colorless’ sport. Or is it?